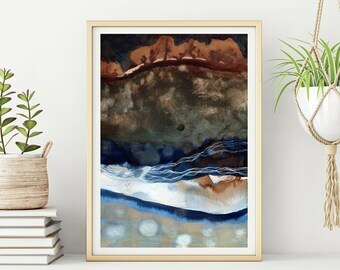 Announcement Hello and welcome to my online gallery of original abstract paintings and archival prints. Please contact me if you would like a custom painting, we can work together to create an original work of art that is just right for your space! 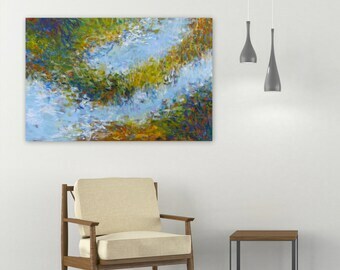 Hello and welcome to my online gallery of original abstract paintings and archival prints. Please contact me if you would like a custom painting, we can work together to create an original work of art that is just right for your space! Thank you for the work! We both love it and it works absolutely great on our wall in the living room. My wife and I think it is much better in person than it shows on the website. We loved how quickly it went out and showed up so we could have it up before our family gathering. Everything worked out great!!! I absolutely adore the painting. It is much more beautiful "in person" than it was here on the website. It's the best purchase I've made for my new apartment so far. It brings me joy every day, I keep looking at it and enjoy it. It was packed really well and it arrived even faster than I expected. I would give it 500 stars if I could. New! "Flow of Life" - Acrylic on 22" x 28". First new painting of 2017! 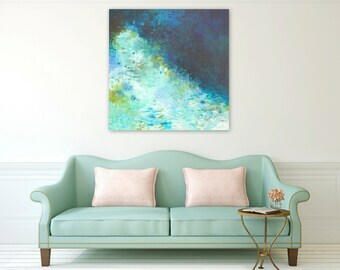 One of three new Spring inspired abstracts in the shop. My painting studio with some of my favorite original paintings of 2016. Custom original painting hanging in my client's home in NYC. Custom original painting hanging in my client's home in Australia. Three custom circle paintings now hanging in a dentist's office in Texas. Artist Statement: "My desire is to continue to explore the meaning of marks, the world of color chemistry, the dimensions of texture and the art of movement and gesture captured on canvas and paper. I try to paint without limits and work in several different distinct, abstract voices that all have their own mood and intention. Abstract painting is a communication with the unknown - it's an experience that is intimate, playful, meditative and soul searching all at once." 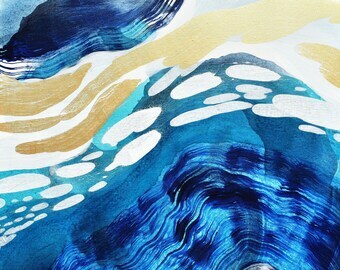 Artist Bio: Jessica Torrant’s abstract paintings reflect her love of color and intuitive painting style. 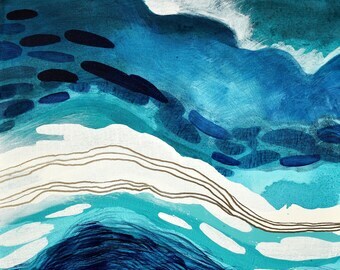 Though classically trained at the University of New Hampshire where she received her BA in Fine Art, it was her time studying abroad at the University of California Santa Cruz that first introduced her to finding an abstract voice. 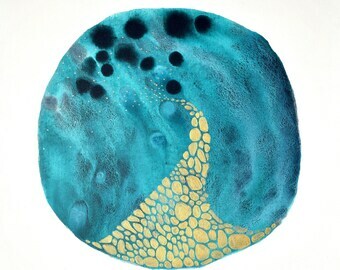 After two decades of creative exploration, Jessica still enjoys experimenting with new mediums and techniques. 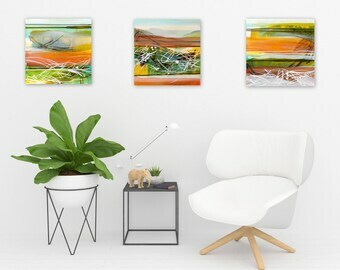 Her current work in fluid mixed media is a reconnection with nature and reflective solitude, two aspects of her early life growing up on a farm as an only child that have been consistent friends and healers in her life. Jessica was born and raised in Enfield, Connecticut and currently lives in the rural town of Ellington, Connecticut with her husband, author Robert Duperre. Hello and welcome to my shop! I am the artist and owner of this shop and manage all aspects behind the scenes. Customer service is a top priority for me, so if you have any questions at all, please contact me and I will reply usually within 24 hours or less. Please contact me if you wish to make a return for any reason. Please note that buyers pay for return shipping. I ship via USPS mail and include tracking and insurance with all US purchases. International shipping is estimated and if actual shipping is less than charged, I will refund the difference once your package has been shipped. Please note that if you are outside the US, you may be required by your country to pay a customs charge. I mark all custom forms as merchandise at its true value because, well, I'm honest like that! (Sorry, I will not mark items as gifts.) I take great care to make sure my packages are very secure, but if you have any damages please contact me right away and I will do my best to remedy the situation via a replacement, return and/or refund.